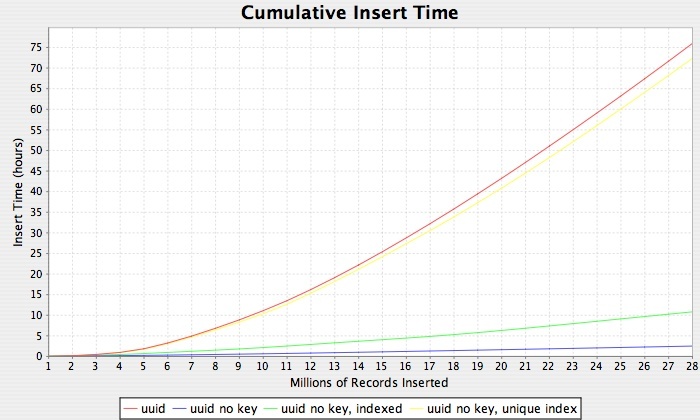 When working with MySQL it is common to choose auto incrementing integer primary keys; however, there are situations where using a GUID/UUID is desirable. For example, prior to MySQL 5.0, you were unable to safely use auto incrementing primary keys in a multi-master replicated setup due to potential (and inevitable) duplicate key generation on the multiple masters. (This issue can be avoided in MySQL 5.0 and greater by appropriately configuring auto_increment_increment & auto_increment_offset on each master.) Other reasons GUIDs/UUIDs are desirable include: data set merging ease and non-sequential, unique identification for security (think credit card numbers). Regardless of the motivation for their use, there is a very real consequence I encountered while working on a rapidly increasing MySQL InnoDB data set. 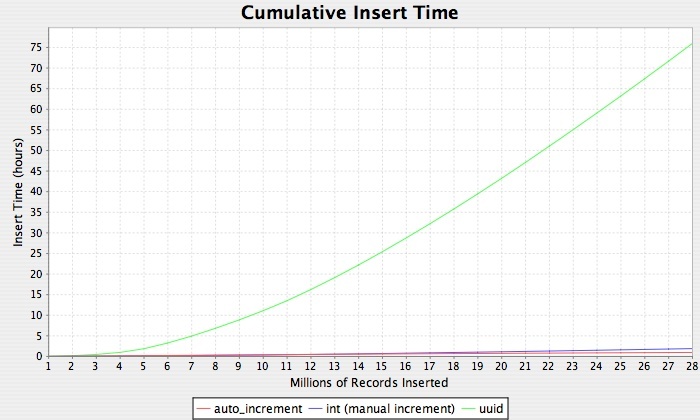 In short, the larger the data set became, the longer it took to insert a new record. This behavior is not necessarily unexpected, but the degree to which the insert time grew became rather problematic. So, years later, I've decided to take a closer look to see if I could replicate this issue with MySQL 5.0.45, and if so, determine (to a degree) what was happening. For the sake of brevity, I am not including the actual Java code used to run this experiment; however, I will explain the general idea. 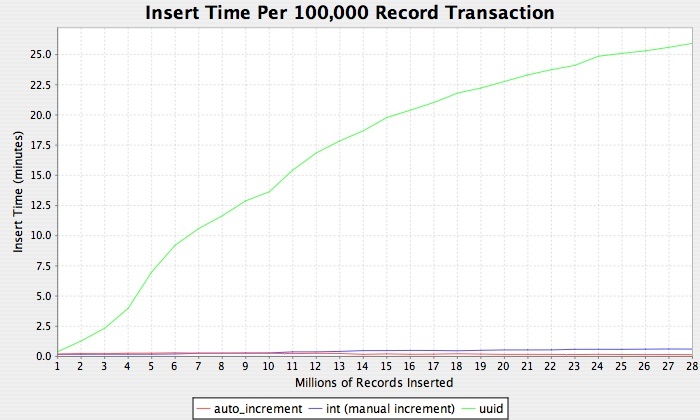 Essentially, the code truncates all tables and then proceeds to loop through each table, inserting 100,000 per transaction, recording the time elapsed. It should be noted that id's for the innodb_integer and innodb_uuid tables are generated in the Java code and passed via a PreparedStatement. 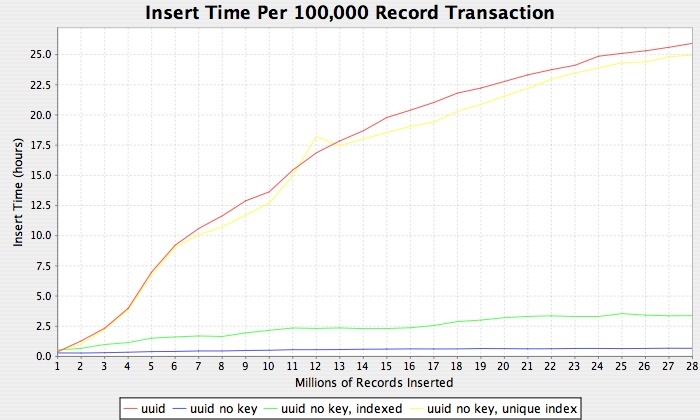 As you can see innodb_uuid_no_key performs closely to its integer counterparts, innodb_uuid_no_key_indexed exhibits the same trend as innodb_uuid to a much less severe degree and innodb_uuid_no_key_unique_indexed is nearly identical to innodb_uuid. So the unique index appears to be the issue here. But why? Well, given the above information, I'd say that MySQL is unable to buffer enough data to guarantee a value is unique and is therefore caused to perform a tremendous amount of reading for each insert to guarantee uniqueness. That's Great and All, But What About MyISAM? The MyISAM results were virtually identical (in scale) to that of InnoDB.